Have you ever heard of Turpan? No? I hadn’t either until I started researching the Silk Road. It is most likely the city’s remoteness that keeps it from being a tourist destination. Located in the province of Xinjiang in Western China, travellers need to spend many hours on a train to get here. Yet, I highly recommend a visit. In touristy China, you won’t find many places that you can enjoy to yourself. Plus, there are enough things to do in this city that make a trip out here worthwhile. The ancient city of Yar, also known as the ruins of Jiaohe, is supposedly one of the best preserved ruins in the world. Located in between two rivers, it prospered more than a thousand years ago before being destroyed by the Mongols in the 13th century. Today, you can walk through the ruins and see the layouts of houses and streets. Many walls are still standing, which makes it an ineresting place to visit. At the end of the city, you will find two temples. Make sure to bring enough water. Turpan is one of the hottest places in China and the sun is merciless out here in the desert. I didn’t expect much of the Irrigation Museum and was pleasantly surprised. The Karez tunnel system is far more impressive than expected, stretching out over huge distances and making it possible to grow grapes in this desert area. Plus, it was built at a time when all tunnels had to be excavated manually. I highly recommend you to take a look at the museum. If you’re lucky, you can taste freshly squeezed grape juice on the grounds, too. 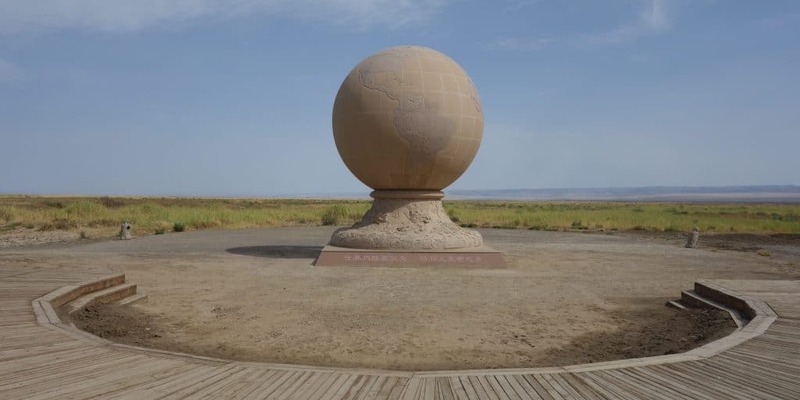 Located close to Turpan, you can find the lowest point in China. It is the second lowest point in the world (the lowest is the Dead Sea) and the lowest landlocked point on earth. Taxi drivers can take you to a saline lake, from where you have to walk the remaining distance to the monument that marks the lowest point. Just a quick reminder that it is not only the lowest but also one of the hottest places in China so make sure to bring plenty of water. Temperatures climb to the high forties in summer. 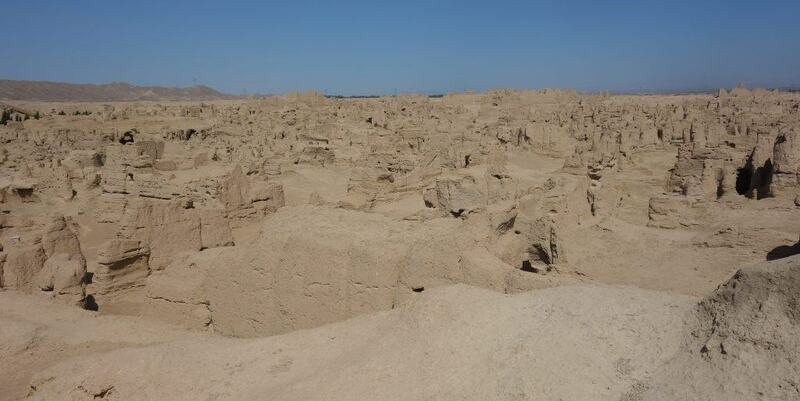 Turpan is not only significant because of its long human history, it also used to be popular amongst dinosaurs, as evidenced by the fossils found in this area. Go to the Turpan Museum to learn more about them and to see some very weirdly shaped dinosaurs. There are, apparently, also Chinese mummies on exhibition, but unfortunately, that part of the museum was closed when I went. Strangely, you are not allowed to wear flip flops in here so make sure to wear closed shoes. 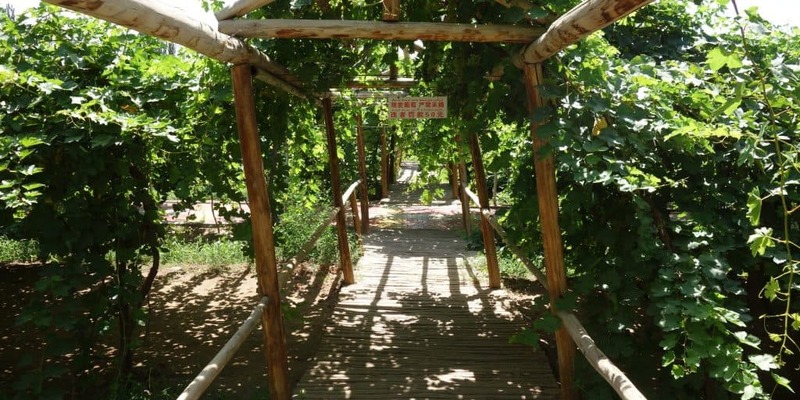 Turpan is an oasis city in the middle of the desert, known for its grapes. What better way to taste them than with a bottle of local wine? Its quality and flavour might not be what you are used to back home, but when are you ever going to get the chance to try Turpan wine again?